Contracts to buy previously owned homes in the US fell in December, the National Association of Realtors (NAR) said Wednesday, in another sign of weakness in the housing market. The NAR’s pending home sales index decreased to a reading of 99.0, down -2.2% from the prior month. November’s index was revised to 101.2 from 101.4. 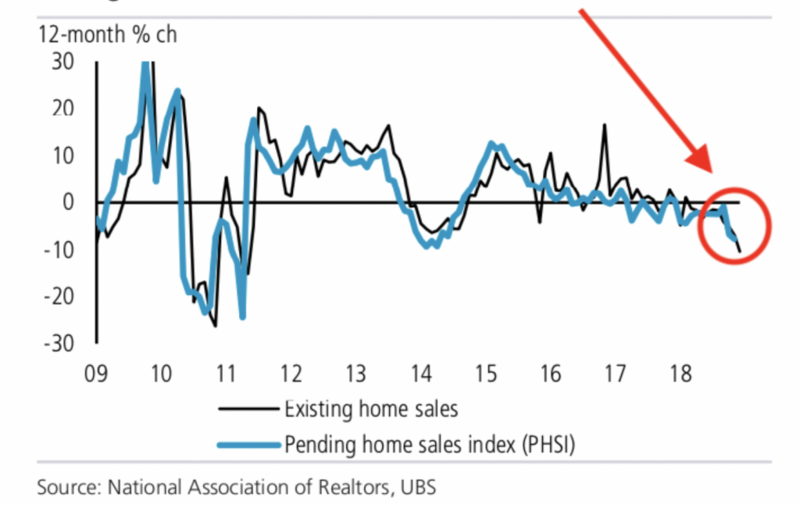 US existing home sales tumbled to their lowest level in three years in December and house price increases slowed sharply. Compared to one year ago, pending sales were down -9.8%. The index of pending home sales fell -2.2%, after a -0.9% decline the previous month, said NAR. The gauge was down -9.5% from a year earlier, the worst drop since early 2014. Contracts fell from the prior month in three of four regions, led by a 5 percent drop in the South. Agreements increased 1.7 percent in the West. The NAR forecasts the median price of existing homes will rise 2.2 percent in 2019, an eight-year low and down from 4.8 percent in 2018. While the figures suggest the housing market was weak at the end of 2018, a recent decline in mortgage rates is likely to give a lift to demand at the start of this year, as home-loan applications have jumped in January 2019. Buyers balked in December amid high prices, scarce supplies and uncertainty stemming from stock-market swings and the partial government shutdown. Federal Reserve policy makers later Wednesday will conclude a two-day meeting. Steady benchmark rates may help keep a lid on mortgage costs in coming months. Even so, the Realtors group forecasts a decline in annual home sales to 5.25 million this year from 5.34 million in 2018, which would mark the first back-to-back drops since the last recession. 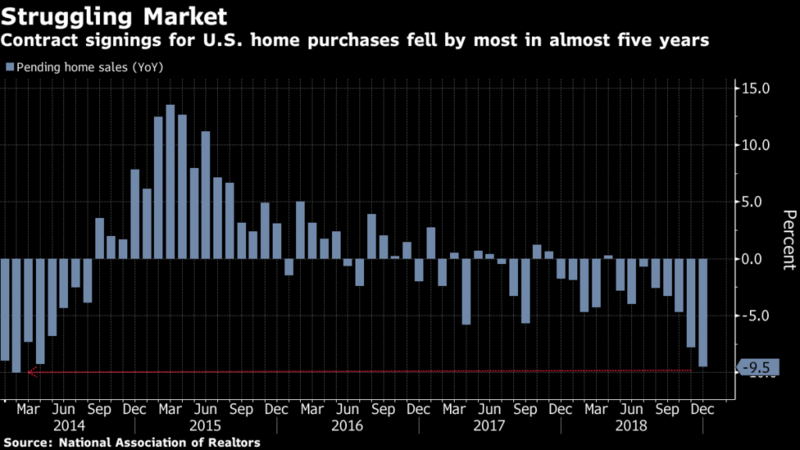 According to an analysis by Business Insider, released Wednesday, US existing home sales (which make up about 90 percent of US home sales) fell off a cliff in 2018, with mortgage lenders recording a sharp fall in applications, originations and profits. During the last quarter, Wells Fargo, the largest bank mortgage originator, saw its mortgage income plunge -50% to US$467 million, while originations fell -28% to US$38 billion. JPMorgan did not fare any better after recording a -46% dive in mortgage income to US$203 million and a -30% decline in originations to US$17.2 billion. Home prices have been ascending for years, with. the median price for existing homes in December clocking in at US$253,000, a +2.9% increase from the previous year and the 82nd straight month of gains. It’s not just native US buyers who are balking at high home prices. International buyers led by China, Canada, UK and Mexico are purchasing far fewer homes stateside—by as much as -21%. International buyers are a very significant component of the US housing market considering that they tend to buy more high-end properties. For instance, foreign buyers dropped a median of US$292,400 on homes in 2017, +17.3% higher than the median for homegrown Americans.